It’s been forever and a few days since I last posted anything on my website, but I wanted to make sure to note that today my new novel, The Gone Away Place, releases from Knopf Books for Young Readers. I’m excited as always to have a new book go out into the world, where it will hopefully find the exactly right readers who didn’t know they were even waiting for it, as well as those who have been eagerly anticipating it. A Stranger Things–Twister mash-up for fans of (super)natural thrills. -Kirkus Reviews (Full review can be found here). 1. Talk about it on social media. 2. Share and repost posts you come across about it. 3. Buy it at an indie bookstore. 4. Or buy it wherever you’d like to buy it. 5. Ask for it at your library if they don’t already have it. 6. Review it on Goodreads & Amazon.com and other sites. 7. Take and share pics of it, if you spot it in the wild or get your own copy. It’s hard for books to rise above all the white noise online, so your support is extremely appreciated! Or any other place where you like to buy books, of course. Thank you, and if you read it, I hope you enjoy it! While I already announced this on Facebook and Twitter , I thought I should mention it here on my blog, too, in case someone out there doesn’t keep up with my doings in the socializing networkings of the internet. 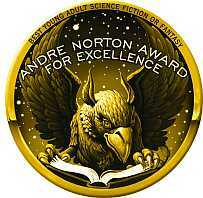 I’ll be serving as a juror for the 2012 Andre Norton Award, which honors outstanding science fiction and fantasy Young Adult and Middle Grade books. Feel free to contact me by email if you have recommendations! The 2012 Andre Norton Award committee has been chosen, and will begin accepting books for consideration. Any young adult/middle grade prose or graphic novel first published in English in 2012 is eligible. The committee will consider all submitted young adult and middle grade books until January 31st, 2013. The award will be presented at the 48th Annual Nebula Awards Weekend in San Jose, California, on May 18. The Andre Norton Award for Young Adult Science Fiction and Fantasy, named to honor prolific science fiction and fantasy author AndreNorton (1912–2005), is a yearly award presented by the Science Fiction and Fantasy Writers of America (SFWA) to the author of an outstanding young adult or middle grade science fiction or fantasy book published in the previous year. The award was established in 2005 by then SFWA president Catherine Asaro and the first SFWA Young Adult Fiction committee and announced on February 20, 2005. The first Norton Award (for the year 2006) was bestowed during the Nebula Awards ceremonies on May 11–13, 2007.